On January 25, the moon will be about 9 degrees below and to the right of Venus, while on Thursday night, it will have shifted to a position about 7 degrees above and to Venus’ right. 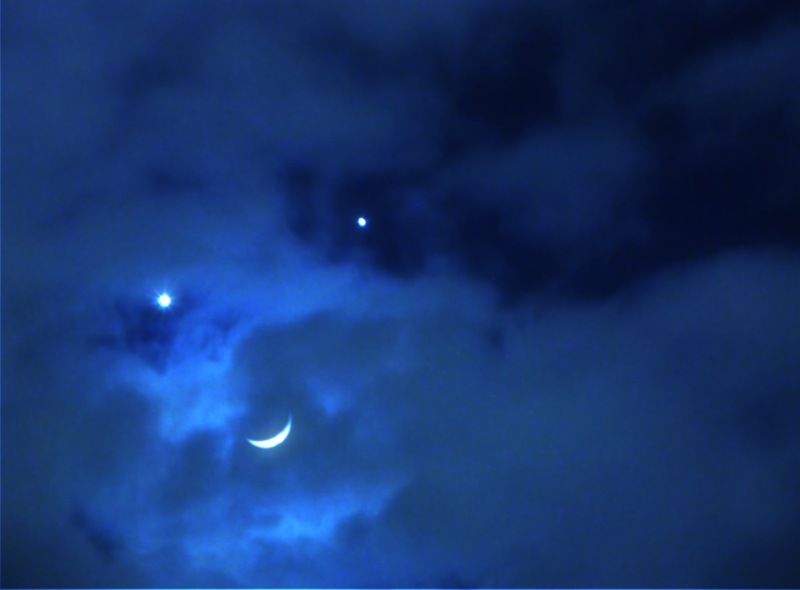 These Venus-moon rendezvous occur on roughly a monthly schedule. Indeed, if Venus were stationary and did not appear to move against the starry background, then a Venus-moon encounter would occur every 27 days, 7 hours and 43 minutes. This is called a “sidereal month,” which is the length of time it takes the moon to circle the Earth once, using the background stars as a reference point. Don’t wait too long after sunset, if you wish to catch Venus and the moon. From most places worldwide, the moon will follow the sun beneath the horizon first, at dusk or early evening. Venus will set an hour or two after dark. Although the lunar crescent and Venus shine fairly close together this evening, most places around the world will see these two shining orbs closest together tomorrow, on the evening of Thursday, January 26, 2012.